If you have a wedding, a birthday or an other party, welcome your guests with place cards and they will feel warmly embraced right from the beginning. Either place cards are positioned on the dinner table or they are arranged on a table at the entrance and inform your guests to which table they are assigned. There are two ways to get beautiful designed place cards to please your guests. For one thing, you can present self-made place cards. On the other hand, you can use the complete services of an advertising agency to save time and avoid stress as the date of the party approaches. Place cards bear the name of the guest on the front side. 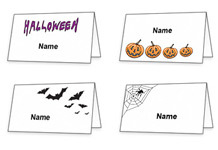 Usually place cards are tended or folded and inside appears the table number or some good wishes. The whole card can be decorated with friendship symbols like doves, rings, hearts, or flowers. It looks very attractive if the place card's colors suit to the pottery or to the tablecloth. This very elegant impression gives your party a touch of nobility. Place cards are not only very beautiful but also very practical. They are easily to change if you want to rearrange the seating order. © Copyright 2009, free-printable.com and its licensors. All rights reserved.